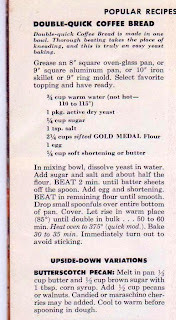 Loving the wholesome satisfaction that baking with yeast brings, but not always having the time it requires, I was delighted to come across Double-Quick Coffee Bread in the 1955 Gold Medal Jubilee pamphlet. 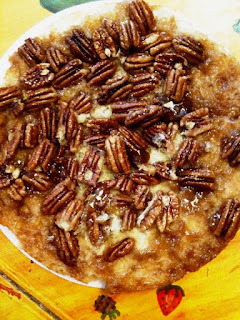 Here was a "coffee bread" made in one bowl. Beating the dough with an electric mixer took the place of kneading (which, while quite enjoyable, can be messy and time-consuming). Not only did the rising take twice as long as the recipe said, negating the appeal of "double quick," but worse, the finished product was simply strange. First of all, what the heck is "coffee bread?" I came to realize (too late) that it's basically a bread that gets its sweetness from one of the "variation" toppings. 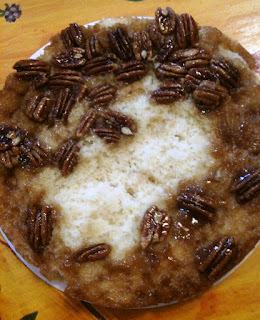 But there was no synergy between the sweet topping (I made the butterscotch pecan variation) and the plain bread. A sweet topping on bread can certainly be sublime; there's nothing lovelier than a fresh baguette spread with raspberry jam. There were other problems. 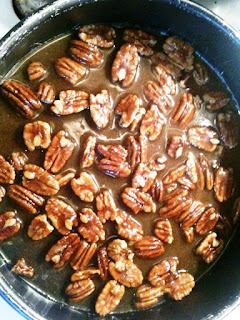 Most of the "upside down" topping stuck to the bottom of the pan, giving me the messy and time-consuming task of peeling the pecans one-by-one from the pan and transferring them to their rightful place atop the bread. Here's the recipe (not that I'd recommend making it, though). 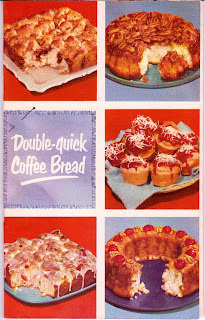 Susan, Remember the pull apart coffee cake your mother used to make? I still remember us sitting around the kitchen table pulling off the balls of sugary wrapped dough until it was almost gone. Do you have that recipe? Yes! And yes! I'll find it and send it to you. I haven't made it in a while, so thanks for reminding me. I think it's the only thing my mother ever baked that wasn't from a mix!